Momoko announces that November 29th is ‘Ii Fuku no Hi’ – ‘Good Clothes Day’. A day for highly recommended winter fashion items and popular techniques for making use of clothes (Airi: ‘That’s a clearly defined day!‘). 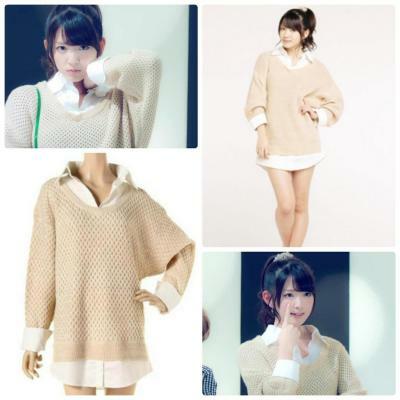 Fashion leader Miyabi is asked for her recommendation – she doesn’t know much about popular techniques, but at any rate, she recommends knitwear, for girls wanting to look cute in winter. Something white with large stitched knits. Airi, however, finds it cold if she goes out with large stitches. The wind blows through the gaps. Miyabi thinks that it’d be fine, but the other two disagree. They’d have to wear Heattech clothes on the inside, which would clash with the white knit. Then there’s some confusion about whether Miyabi’s talking about ‘knit’ or ‘net’. At photo shoots, Momoko’s often told that longish sleeves are the way to go – long enough to cover the palms, the so-called ‘moe-sode‘. Airi also brings up mufflers, which the girls agree are both cute and warm. The current hot topic is this year’s candidates for Japanese buzzword of the year. Today’s discussion topic: The 2014 buzzword of the year that we would select. Momoko lists down last year’s winners: ‘Ima desho‘, ‘O•mo•te•na•shi’, ‘Je Je Je‘, and ‘Baegaeshi‘. The girls agree that the strongest contender for the year would be ‘Dame yo~ dame dame‘ (No way~No, no). This buzzword comes from a sketch by the female comedy duo Nippon Erekiteru Rengō, where the white-faced dutch wife Akemi would rebuff her suitor Hosogai by going ‘Dame yo~ dame dame‘ whenever he asks ‘Isn’t it all right [to accept my proposal]?’. During Halloween, Airi actually saw four people dressed up as Akemi, and according to Momoko, the news had shown 22 Akemis gathered together. Airi basically found them scary, with their heavy white make-up. Momoko: Simply said, if they go ‘Is it all right if I go for an AKB handshake too?‘, you’d go ‘Dame yo~ dame dame‘. Airi: That’s easy to understand. And then there’s the very end of the sketch. Airi isn’t familiar with the sketch, so when people try that part on her, she has no idea how to react and just laughs sheepishly. Momoko then asks: what buzzwords did they often make use of then? They can’t remember what was popular in the first half of the year. In the latter half, the word ‘yuuri’ left an impression. My dictionary says that the word ‘yuuri’ itself means ‘advantageous, profitable’, but I’m not sure where it comes from. It doesn’t seem to be in the top 50 buzzwords of 2014 list, at the very least. The girls look forward to what the results will be. If you’re interested, ‘Dame da yo~ Dame Dame‘ did end up being chosen as one of two words of 2014. This week’s secret voice note comes from a 25 year old guy who’s new to the city. He was introduced to a girl by a friend, and when he went for a meal with her, she was so wonderful that she stole his heart. However, he also found out that she has a lot of guy friends and regularly goes out for meals with them. As someone from the countryside, he feels uneasy about it, but perhaps this might be the ‘Tokyo style’. He asks if he’s taking the correct action by letting it be, or should he honestly tell her his feelings? Airi: What is this ‘Tokyo style’? Sounds interesting. Momoko doesn’t really have any idea on how to answer. Airi agrees that it’s a minor problem, but they have to go through it – this is a corner with a wide capacity after all. Small worries could pile up to to form a mountain of troubles, so Momoko proposes they crush this one while it’s still small. Momoko suggests that if she’s going out to have a meal with guys, he should respond with a questioning ‘Eh? You’re going with someone who isn’t me?‘. While Miyabi thinks the best solution would be to just act cool, Airi disagrees, and suggests that he act surprised. Then he could leverage being from the countryside and being ignorant of the ‘Tokyo style’. The ‘pure’ play. But they’re not really sure if that’s what ‘Tokyo style’ is. Relationships depend on the individuals themselves, in the end. Miyabi recommends that if he wants to tell her, then he should. Airi adds that if he’s scared, he might as well quit. She might be easy to ask out for meals, so he should be firm and state that he can only go for meals with people he’s interested in. And if her schedule starts getting too busy to meet, then he’ll know he isn’t the one, at least. That would be the natural flow. And that’s their recommendation. Ty. I just listened to this a few hours ago and got so confused by the first part about the buzz word segment. I’m not really in the loop in whats popular in Japan right now so i was so lost by the conversation lol but thank you for clarifying and adding videos to what they were talking about. I agree with Airi Akemi chan is hella scary. ps. Theres also a segment on hellostation where Fuku chan did the dame yo dame dame. Its her second appearance in the word game thing, atleast now i know where it comes from. Good God what the hell is that Akemi.. It’s scary.. Man if I would rather punch a shark in the nose than meet one of those in a dark alleyway..